This dissertation is concerned with resources for economic development in cities in Africa. It argues for the greater understanding of the dynamics, practices and cultures within popular neighbourhoods and for recognising the creativity within them as a critical resource. Such an appeal is apt in a context where informal initiative has been suppressed, neglected and its potential wider influence curtailed. This paper takes the view that the popular neighbourhood is not just a place of needs, nor are its resources important only for addressing its own pressing issues; rather, it can be a major contributor to economic development in cities of Africa. This argument draws on concepts and findings from two research initiatives on a Lusaka settlement which delved into community resourcefulness, during a time of consolidation and at a time of serious economic stress. 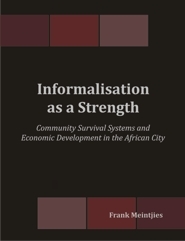 The main proposition is that economic strategy formulation in African cities needs to be based on a good grasp of the constraints and creativity of popular neighbourhoods and the survival strategies they spawn.